NEW: 2019 Fosway 9-Grids™ for Learning Systems and Digital Learning are now live. 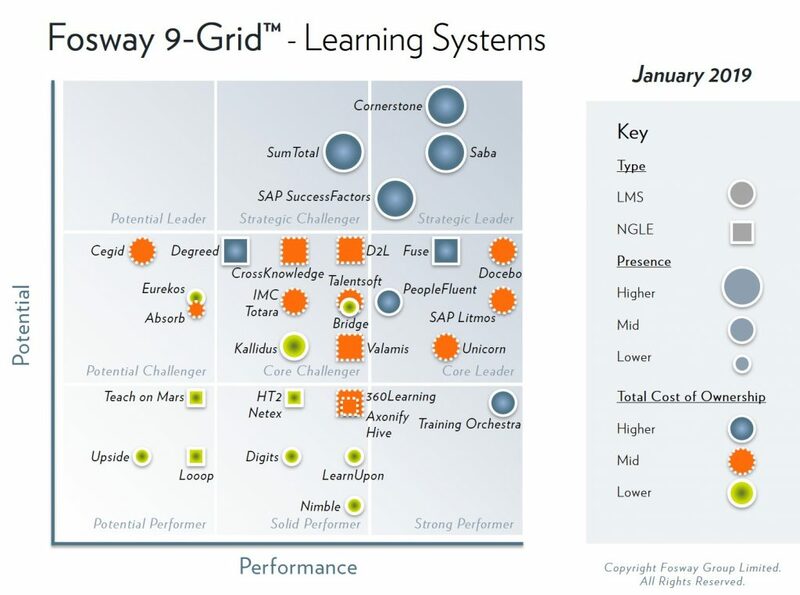 9-Grid™ is a five dimensional market analysis model that is used to understand the relative position of solutions and providers in the learning and talent systems market. 9-Grid™ has been in evolution since 2008 and is driven by demand for analysis and insight designed for European-based companies. Too often, organisations have had to rely on a US-centric view. We created 9-Grid™ based on Fosway’s unrivalled, independent research in the Next Generation HR, Talent and Learning markets over 20 years, and with the insights and experience of our Corporate Research Network. This comprises over 150 leading global companies; typically enterprise-scale organisations with a large European presence. A key difference of the 9-Grid™ to other analyst models, is that all of the nine zones have value and a set of actions to maximise that value. 9-Grid™ explicitly prompts real conversations around the trade-off between customer performance, solution sophistication and total cost of ownership. Please note: Due to the different pace of innovation and nature of the market developments in authoring systems, the Fosway 9-Grid™ for Authoring Systems remains under review, and plans for updates will be confirmed in the future. What the Fosway team don’t know about selecting vendors, systems and solutions isn’t worth knowing! When there are so many vested interests and so much conflicting advice, how do you make the best decisions around your Next Generation HR and Learning strategies? Our aim is to help you make the right decisions, faster, and with greater confidence. We will help you get a broader perspective on your needs and a deeper insight as to what is available than just speaking to suppliers. The expansion of our Next Generation Learning research, has already seen newly recalibrated 9-Grids™ launched for Learning Systems and Digital Learning to reflect major market shifts and customer demands. And with the addition of the new Fosway HR analyst practice, the 9-Grid™ model will be extended to key markets including Talent Acquisition later in 2019.